The first stage of our project in Solomon Islands included installing solar panels to power lights in schools, such as in this photo. The next stage includes installing similar panels on rural health posts. Among the benefits, it will mean those assisting women giving birth at night will have adequate light.The first stage of our project in Solomon Islands included installing solar panels to power lights in schools, such as in this photo. The next stage includes installing similar panels on rural health posts. Among the benefits, it will mean those assisting women giving birth at night will have adequate light. The world’s changing climate is having hugely destructive impacts on people’s lives, and communities in the developing world are much more vulnerable. They are less resilient to extreme weather events such as cyclones and floods, and changing weather patterns have a greater impact on crops, herds and fish stocks used to feed communities. The spread of climate-related diseases, such as malaria carried by mosquitoes, also has a huge impact. Many people in developing communities are also stuck in cycles of poverty that contribute to the degradation of their own environment. For example, energy poverty means many families around the world have little choice but to keep spending money from their limited incomes on kerosene lamps that emit dangerous and polluting fumes, and are linked to deadly house fires. We are working in the Pacific island nations of Vanuatu and Solomon Islands to reduce reliance on dangerous and polluting kerosene lamps and create sustainable income-generation opportunities through our solar lights projects. We are also working in Mozambique to provide clean water and sanitation to rural communities. More than 80 per cent of the population of Solomon Islands and Vanuatu live in rural areas scattered across multiple, remote islands. Many of these people are not connected to the electricity grid, which adds to the challenges faced by these communities. This is sometimes referred to as ‘energy poverty’. Across the Pacific, communities are concerned about the impacts of changing weather conditions given their high level of vulnerability to climate shocks such as cyclones, torrential downpours and tidal changes resulting in flooding. In many places, people rely on kerosene lamps for light. These are dangerous and polluting, and place great strain on a family’s limited finances. Every year these lamps burn 2.5 million people and cause hundreds of thousands of related deaths. Inhaling their fumes is also akin to smoking two packs of cigarettes a day. 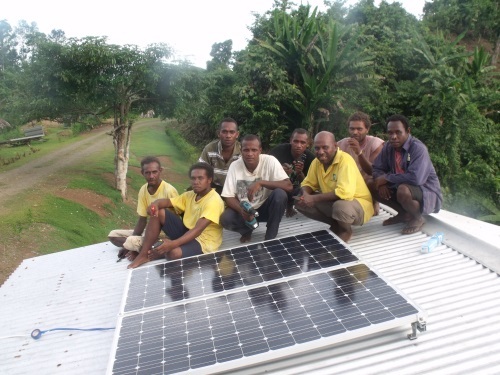 We are working with our partner, the Anglican Church of Melanesia, and their Mother’s Union in both countries to increase access to solar lighting through the Bringing Light to Rural Communities in Solomon Islands project and the Livelihoods and Women’s Empowerment in Vanuatu project. Using solar energy supports both long-term sustainability and improves quality of life. Decreasing reliance on kerosene, which is both expensive and dangerous, is an obvious benefit. In Solomon Islands the project has contributed to the complete elimination of kerosene lamp use in one province, and another province is not far behind. The projects also help create jobs and income –people are given business training and ‘loaned’ a small number of lights, which they then sell at a small profit. After they have repaid the original loan, they can purchase or borrow more lights and repeat the process. This creates income independence and means people are less likely to take up jobs in industries that damage the environment. Funding: These projects are funded by grants from the Australian Government’s aid program and donations from the Australian public. * Over the last three years, Anglican Overseas Aid supported a WASH project in the Diocese of Niassa in northern Mozambique. The project ended in June 2016. The program was evaluated in 2016 and was found to be highly successful. Information about water and sanitation was distributed widely by a coordinated network of people. A small team of five ‘Adeptos’ provided training to village-based ‘Animators’, who provided oversight and support to volunteer counsellors, who in turn conducted door-to-door education. As a result of this, the program generated significant change in people’s behaviours. Local staff, volunteers and community members showed a great understanding of what they had learnt. Community members also spoke of and demonstrated how their behaviour had changed. These behaviour changes were shown in reductions in illness and mortality, from water borne and faecal disease, especially among infants. Due to the success of the program, it has now been integrated into our Community-led Health and Wellbeing project in the Diocese of Niassa. Global emissions of carbon dioxide have increased by over 50% since 1990. Fish catches in some areas of the tropics are projected to fall by between 40% and 60% due to climate change. As a result of climate change causing food insecurity, changes in temperature and rainfall patterns could lead to food price rises of between 3% and 84% by 2050. About 3.5 million people, mainly women and children, die each year from respiratory illness due to harmful indoor air pollution from wood and biomass cookstoves.